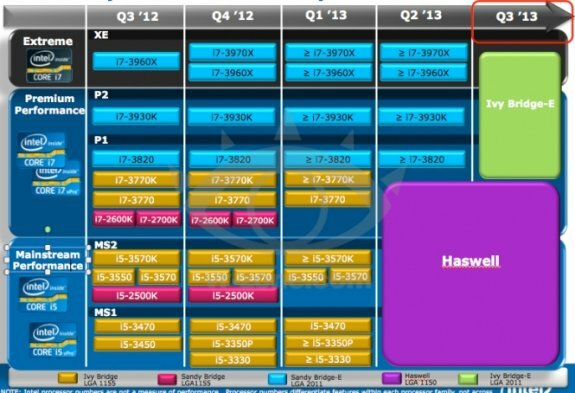 A newly leaked Intel processor roadmap confirms that the Ivy Bridge-E roadmap is still far away. The picture posted at VR Zone China reveals Ivy Bridge-E is currently planned for Q3 2013, a quarter after the launch of Haswell. Intel's next-generation Ivy Bridge-E chips are up-scaled versions of today's Core "Ivy Bridge" chips, built on the same 22 nm process, with more processing cores, memory channels, cache, and PCI-Express 3.0 certified system interfaces. It remains to be seen if Intel launches a new chipset to go with the new processor, or retains the X79 chipset with a few minor updates in the form of steppings. The company retained its X58 Express chipset over the first two HEDT processor generations (45 nm Core i7 "Bloomfield" and 32 nm Core i7 "Westmere").